Signal before broadcasting the following warning. and moving south southwest at 12 kilometres per hour towards the coast. crossing between Townsville and Bowen on Friday morning. Lawrence overnight and extending to adjacent inland areas later Friday morning. DESTRUCTIVE WIND GUSTS to 150 kilometres per hour are possible near the centre. do so by the authorities. tide on Friday. Large waves may produce minor flooding along the foreshore. Central West districts on Friday. and be prepared to shelter in a safe place. The next advice will be issued by 11:00 pm EST Thursday 30 January. Due to the radar still not giving a great example of a clear defined eye I think its still a little undeveloped. It will run out of time, get steered a bit further south by the lower levels and cross between AYR and BOWEN. 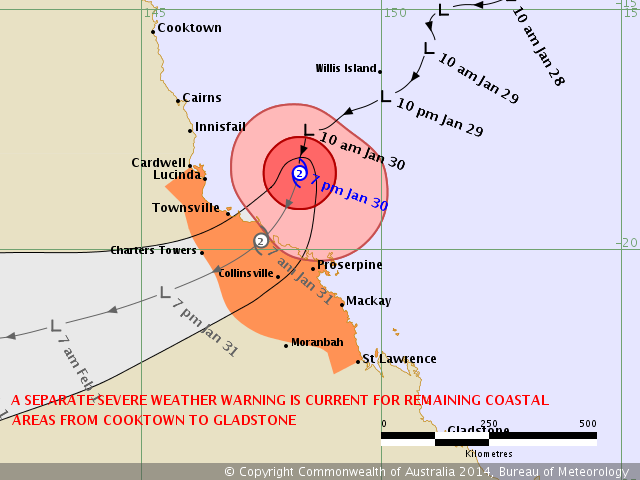 Bowen would be in the immediate 10-50kms south of the system and get the best of the winds. Wait and see. Edit: update makes a shambles of all that though lol Should still cross there though. You know what these systems are like they kind of bowling ball roll it down the coast just prior to landfall. yeah I reckon Bowen. Aaghhh, 975hpa, now we have a storm. how come cardwell is still on a warning if they think bowen or south of that will get it? You must be clairvoinant. Prob in next TC advice. Maybe if it can keep intensify the more erratic it will become and could potentially go anywhere in the warning area. P.s its category is determined by windspeed I'm pretty sure. Too close to land IMO for much more intensification. Can already see the SW side where it's interacting with land losing wind speed. coast between Townsville and Bowen in the early hours of Friday morning." crossing between Townsville and Bowen on Friday morning." Anyone checked #of ppl on site? Very impressive. WZ gogogo. Generated in 0.030 seconds in which 0.016 seconds were spent on a total of 13 queries. Zlib compression disabled.